Status reports sometimes have a bad reputation, especially among those who have to write or compile them – employees. Weekdone is a weekly status reporting software and our clients range from small businesses up to Fortune 500 companies. The feedback we get from people has always been good. Above all, weekly status reports give you a quick insights into what other team members are up to and saves time on unnecessary emails and meetings. Therefore, I would like to share and debunk the most common myths about status reporting, so others would have the chance to see the benefits behind these myths. I agree, if not used correctly, status reports sometimes can be complicated. But if status reports are used effectively, they can help a lot. The most effective and simple method for reporting is PPP – Progress, Plans, Problems. Used by the likes of Skype, Ebay and Facebook. It is as easy as ABC. Yes, often times it is true and it's not their fault. The main problem is that employees don't understand how filling a status report helps them personally. It only takes up more of their time. From my own perspective, I would like to explain and list top 4 reasons how weekly status reporting helps me as an individual and from the perspective of an employee, who I am. In addition, working for Weekdone was my first experience doing status reports on a weekly basis. First thing I noticed was that I was concentrating more on what should be done this week, not mindlessly doing one task after another. I realized it through the simple act of planning my weekly tasks ahead of time. At Weekdone we have a rule not to list more than 5-7 tasks for the week. This approach helps you prioritize and focus on the task that matter. To conclude, status reporting helps me be more efficient and be better at my job. Secondly, status reports help me to communicate with my very busy boss. I am sure, I'm not the only one whose boss is constantly away or too busy to answer my emails. Doing status reports gives me a piece of mind that he knows what I am doing. Furthermore, I can get the precious feedback from him. That doesn't mean you shouldn't do 1-1 meetings with your superiors, but instead do them on the basis of your progress. In conclusion, status reports allow me and my boss to constructively communicate in spite of our busy schedules. I briefly touched on it in the previous point, but status reporting gives me a quick overview about what both my team and other departments are doing. I am the Marketing Manager at Weekdone and half of the week I work from home. So, knowing what the design team is up to is crucial for me. 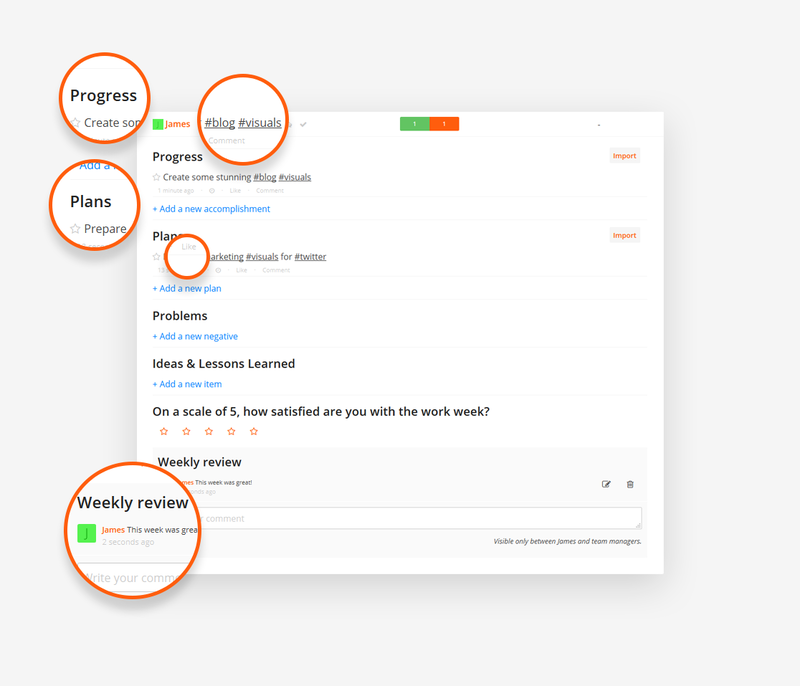 In Weekdone, we give each other feedback for the progress made or even commenting on the individual tasks. On Weekdone we can also like or use emojis to give our feedback more of a personal touch. All in all, it improves our internal communication and engages everybody to work towards a common goal without misunderstandings. Status reporting actually saves time. There are less status update meetings. In fact, we only do it once a week. A lot less emails about our current status. I used to work in a big corporate bank and I now realize in hindsight, how much time we lost on trying to understand what others are doing and what is the current status of a particular project. Thirdly, when done right, there is no need for your boss or other team members to call you and double check on your progress. To sum up, status reporting helps me and my team save time on things that waste time and helps me to focus on tasks that matter the most. Talking to clients and people who are looking for a team management tool, I often hear the arguments like “we use Google Excel Sheets for it” or even “paper forms” to file in their progress. In some cases you really don't need a reporting software. If you are a team of two people, there is no need for it. But if there is more than 2 people, the separate spreadsheets or files can get overwhelming over time. Furthermore, status reports are meant to help you, not consume even more time. So, when you need to improve your internal communication or get a quick overview of everybody's current status, I strongly recommend automated weekly reports. 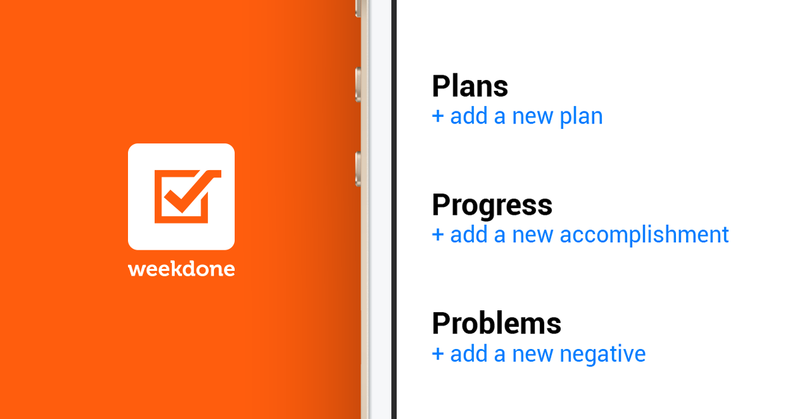 It gives you a weekly overview of progress, problems, employee happiness and future goals. All in the name of being more efficient and better at your jobs.